The mural in the courtyard of the Firehall Arts Centre, Radius, is based on the cultural links and connectivity of the Aboriginal, Chinese and Japanese communities. These distinct cultures all converge in Vancouver’s historic centre, and their text, symbols and narratives are woven into the mural’s design. Artists and mentored artists conceived the design through several workshops in each of the three communities. The four paddles, symbolizing the four directions and containing images of Salish serpents, include one that is in flames. This refers to the Great Fire of Vancouver, in 1886, an event that left many from the city trapped on the shores of Burrard Inlet. Indians of the Coast Salish Squamish tribe arrived in dugout canoes, rescuing people and sheltering them in their nearby village church. The poem that was sung as they paddled the inlet is inscribed on the bow of the canoe. Across the bamboo on the left is superimposed the Hanji character meaning 'Harmony'. Chinese text depicts the natural beauty of Vancouver, also expressing the hope to live together in harmony. Depicted in characters along the red banner and across the bamboo, is the text: ‘ Bright Mountain, Clear Water’, ‘harmonious, melodious’, and ‘cloudy city,’ reflecting how the Chinese poetically refer to Vancouver. Underlying origami, running through the mural suggests the broad reach and integration of the Japanese community. On the right, appears the word 'Hometown' as Vancouver was and still is, popularly known. The word, "Hometown", represents Vancouver as being a place of home for all cultures. ‘It reminds us of where we grew up, giving us a nostalgic feeling of home.’ Sakura, or Japanese cherry blossoms, represent a gesture of peace between Japan and Canada, post-World War. At the upper right, a Japanese Obi (kimono sash) takes on the form of mountains, and origami cranes, archetypes of Japanese tradition, float over the surface. At the bottom right, Koi provide a connection between Chinese and Japanese cultures. 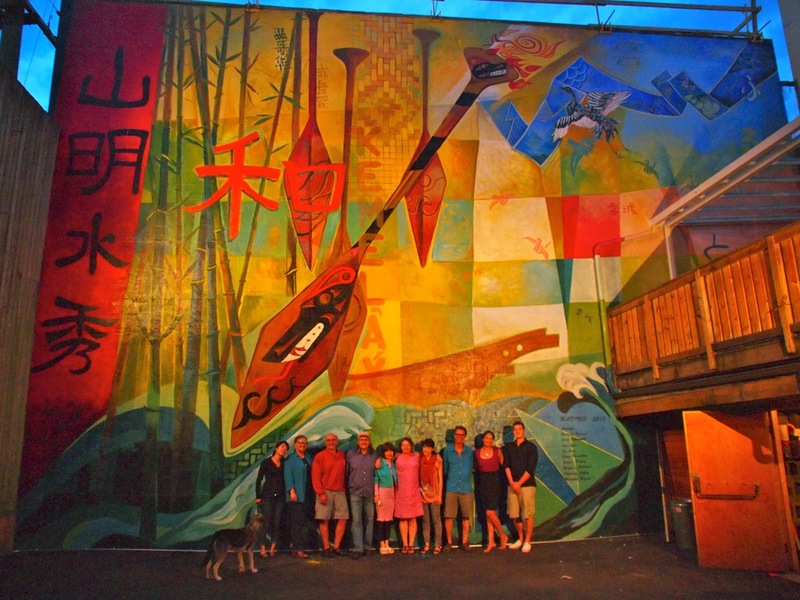 Mural artists: Richard Tetrault, Jerry Whitehead, June Yun, Eri Ishii and Gerald Pedros, with mentored artists Marissa Nahanee, Christine Chung and Mayuka Hisata. Coordinators for the mural were Richard Tetrault and Esther Rausenberg, of Creative Cultural Collaborations Society. The project was generously supported by the City of Vancouver. Thanks to the City and Firehall Arts Centre and staff for their enthusiastic support of this project.